My Christmas Run race outfit! This is the weekend of races. Nothing stressful though. Tomorrow a bunch of us are dressing up and running the Santa Monica-Venice Christmas Run 10K. 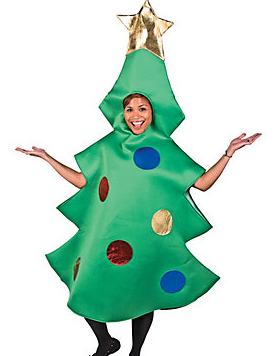 I’m going to try to run sub-7 minute miles in my HUGE Christmas tree outfit. We’ll see how it goes. I can’t really be disappointed if my branches hold me back 🙂 After the 10K we are skipping, singing and dancing through the 5K. Sunday is the final Girls on the Run 5K in Playa del Rey. It is an untimed event. I wanted to share a quick pre-race rituals post (although I am not really following them today because this weekend’s runs are more for fun). I started running cross-country when I was 11 years old, so I have had lots of opportunities to learn what I can and cannot eat before a race. In sixth grade I learned that Doritos 5 minutes before a race is a bad idea. I also discovered that being dehydrated before a race made my mouth dry and saliva thick, gross and hard to swallow. If you get this from nerves, chewing gum or sucking on a jolly rancher during the race helps tremendously. I have unfortunately learned that you CAN carbo-load too much. 2 huge servings of lasagna will actually hurt you. Likely mid-race. Here is what I have learned through trial and error works for me the day before and morning of a race. Cinnamon raisin bagel (not whole wheat) with peanut butter and jelly. Mini-bagel with butter and jelly if it is a short race. Just a banana for 5K. What are your pre-race nutrition & hydration rituals? Click on this link to spread the power of running. Donate to Ellen and my Girls on the Run fundraiser to ensure girls across Los Angeles have access to this empowering program!